Build powerful, repeatable business processes to maximize efficiency. Most people dread on-the-job paperwork, especially standard operating procedures (SOPs). But, SOPs don’t have to be a chore to create or read. Done correctly, an SOP can guide you clearly through tasks, including complicated and hazardous work. This article provides everything you need to know about SOPs. We discuss the purpose of standard operating procedures, the industries and standards that use SOPs to support and track compliance, and how software can assist in creating and managing SOPs. Then, we look at the characteristics and common elements of SOPs and explain the steps to create an SOP. 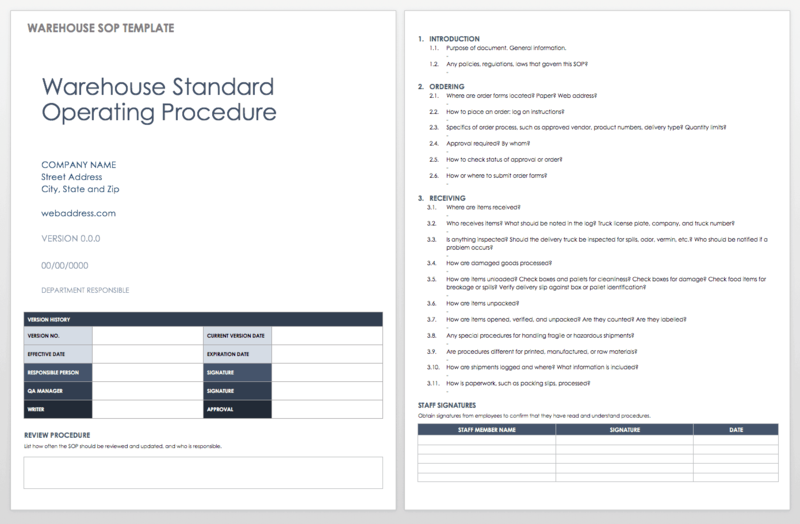 Finally, we provide a variety of SOP templates in Word format to streamline and standardize your efforts. What Is the Purpose of Standard Operating Procedures? Who Uses Standard Operating Procedure Templates? 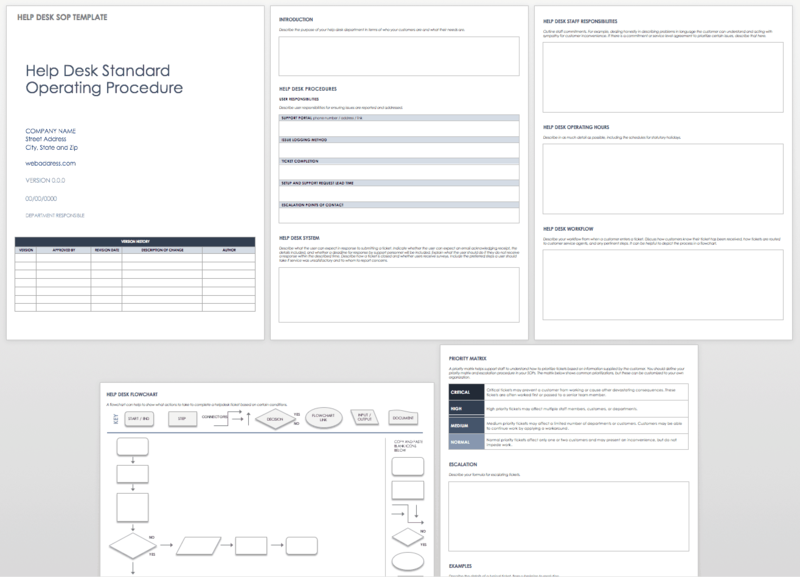 What Is the Format of a Standard Operating Procedure Template? How Do You Write a Procedure? A standard operating procedure (SOP) is a set of written steps that captures the best practices of a field or industry as applied in a specific organization. SOPs are often created to provide specific steps when activities include known hazards that could inflict loss of property or injury, but SOPs also ensure the repeatability and consistency of the performance of any type of process. SOPs help employees perform complicated tasks: ones in which remembering every detail of a procedure can be difficult or in which a precise sequence of steps is essential. These documents create measurable processes that provide structured approaches in the event of problems or emergencies. SOPs can be thought of as a script — in the case of the service industry, SOPs often are a script, with a call center or hospitality workers greeting customers and responding to situations with a spoken-word formula. When SOPs originate in compliance requirements, they standardize activity, guarantee consistency and quality, and provide a means to record performance metrics and capture any path to deviation in results. These records can aid in the corrective action process. The SOP development, implementation, and revision procedure is similar to the plan-do-check-act (PDCA) quality management model: Research the steps in a procedure (plan); create the procedure (do); verify the procedure in a walk-through (check); and use the SOP to standardize daily activity and revise as needed (act). The procedures of an SOP also form the basis for training material for new employees. Moreover, they provide remedial or refresher training for existing employees. However, while SOPs pave a pathway to greater efficiencies in daily practices, creating them and maintaining them should never become an aim in itself. SOPs must serve the quality and efficiency, not the other way around. Standard operating procedure software provides centralized, often cloud-based, support for SOPs. Functions include purpose-built templates for documents, document and change control, review scheduling, tracking for revision approvals, task tracking, training and logging of training sessions, acting as a central repository for documents, and more. Some packages cost as little as $40 a month. An SOP generally includes two parts: identifying information (document control information) and content, which includes the procedures and supporting information. Creating an SOP may seem daunting. But, if you follow a few simple steps, you can quickly get your document on track. 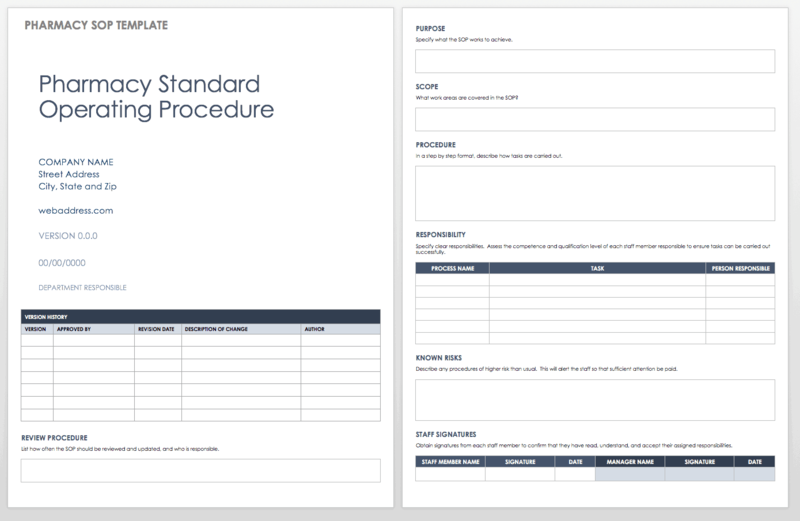 Find an industry or department-specific standard operating procedure template, or choose an appropriate format for creating a new template. Consider the audience for the document and write for them. Include the advice of potential users of the SOP as you write procedures. Decide whether you want a manual of many procedures or individual procedures. Consider the scope of the document — not only in terms of what personnel or departments and activities it applies to, but also in terms of the individual procedure level. Determine where a procedure begins and ends to eliminate overlap and inefficiencies. Use language and tone appropriate to your audience and the function of the document. Also, in any documentation, use proper notation for your field. For example, you may need to precisely annotate workflow charts by using Business Process Modeling Language (BPML). Consider any risks involved in your procedures to encourage safety and to understand the extent of your liability. Verify the procedures to ensure they are correct and streamlined. Make sure that a draft of your SOP is reviewed by a manager with signing authority and by individuals affected by the document. Create a revision schedule to guarantee that SOPs reflect updates in your field and changes in your process. To learn more about writing an SOP, read this article. Use your organization’s usual word processing program to create a template file. Many standard operating procedure templates are available in Microsoft Word, but other word processing programs also work well. Define the format, including styles for headings and body text, fonts, and color. Consider readability as you design. Add common SOP elements as listed above. For each element, add brief explanatory text to suggest the types of content to be added and the format to use. Publish the template and introduce it to the organization. Store your template on a local drive or intranet where everyone who should use it can find it. No matter your line of business, help desk SOPs guide your customer service staff to process online and telephonic customer problems and questions, providing consistency and structure to staff responses. 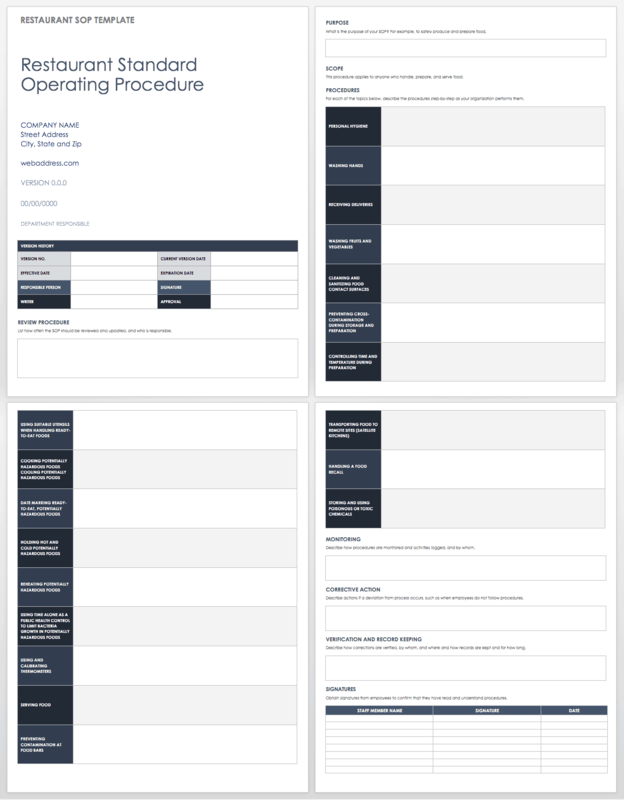 Complete this help desk SOP template to describe such things as information to collect during first contact with a customer, prioritization of issues based on a predefined priority matrix, troubleshooting steps for known issues, and customer follow-up processes. Standard operating procedures are crucial to maintaining consistency and quality of service in a hotel. An SOP can form the basis of a checklist for daily tasks and provides training material for new employees and refresher material for existing employees. A hotel usually has multiple short SOPs covering everything from the check-in process to bill disputes to evening bed turndown. 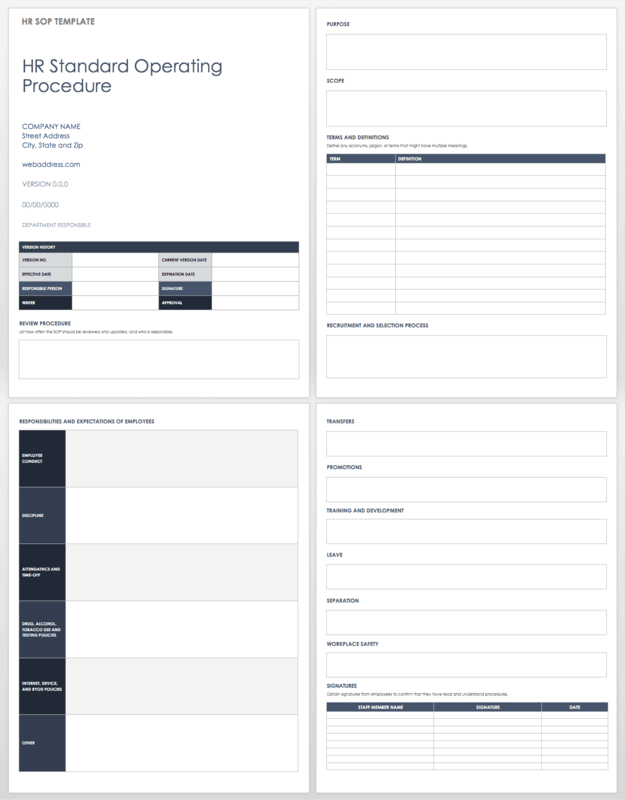 This Word template helps you describe how bell desk staff should greet new guests on arrival, move luggage, gather luggage, assist guests on checkout, and organize and store guest items in long-term storage. Standard operating procedures are crucial to the efficiency and safety of any laboratory. Although not every process or chemical is governed by law, SOPs help employees, students, and others in a lab work safely with chemicals and processes that can cause injury or workspace damage. Laboratory SOPs in particular should be collaborative efforts that leverage the expertise of people who work daily in your facility. Also, augment your own processes by using data sheets and manufacturer documentation to understand and describe substances and equipment. Use this Word template to comply with all the SOPs for working in a lab. Order and routine are important in any warehouse, but if your facility handles regulated material, well-considered procedures may be necessary for compliance. 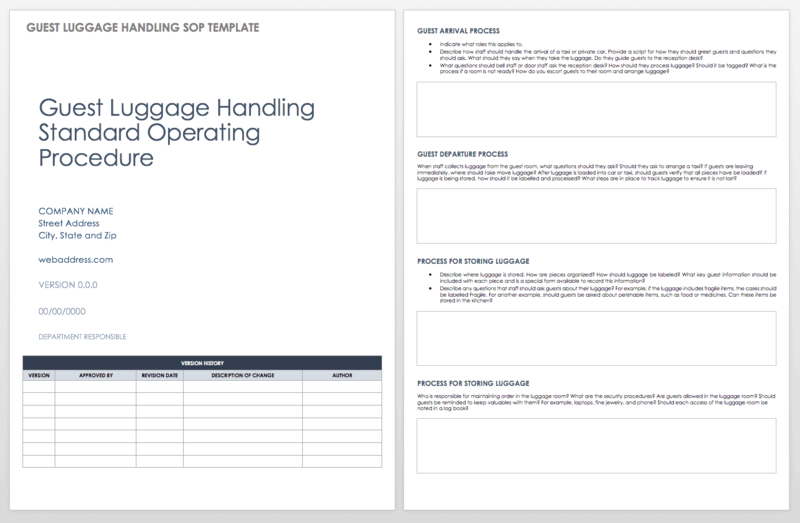 Use this SOP template in Word to detail approved vendors and processes for ordering material, catalog where shipments are received, document how deliveries should be verified before acceptance, and keep track of how paperwork (such as packing slips and labels) is processed. IT standard operating procedures may be required by your organization for compliance with financial and technical regulations and standards. This IT standard operating procedure template in Word provides a reminder not only to define and document troubleshooting, security events, and setup procedures, but also to create maintenance schedules, procedure checklists, and configuration notes and diagrams. Human resources SOPs can cover many aspects of an organization’s functions. 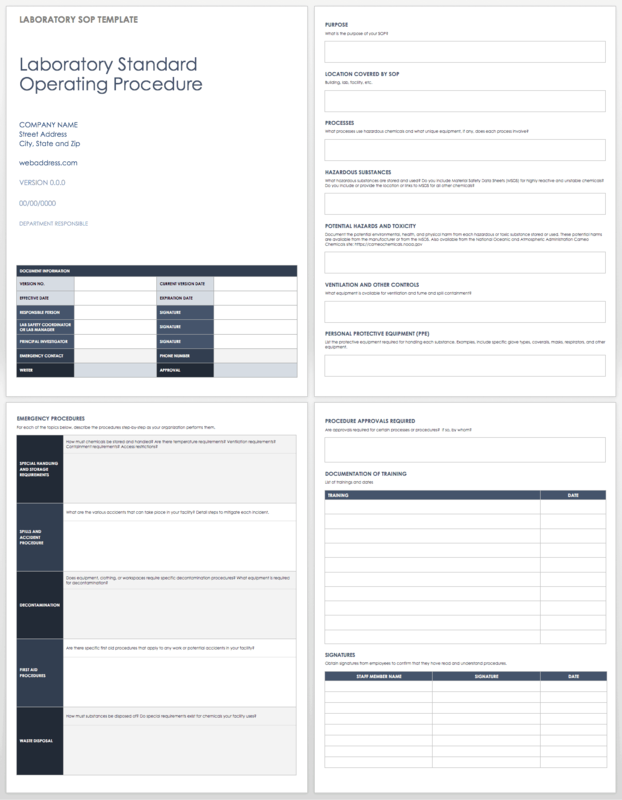 Use this SOP template in Word to detail HR processes from recruitment to hiring and termination for such matters as employee conduct, computer and phone policy, and more. Also, consider these employee onboarding checklists. Undoubtedly, the most important SOP a restaurant of any size can publish concerns food safety. This restaurant food safety SOP template in Word is essentially a manual that covers employee hygiene, food storage, correct cooking and cooling procedures, utensil use, and more. A restaurant SOP should also specify who inspects for correct procedure, logging practices, and record archiving routines. The goal of a pharmacy SOP is risk management. Use this pharmacy template in Word to detail definitions, responsibilities, and procedures. When fulfilling CAPA requirements, pharmacy SOPs should be updated to reflect improved practices. 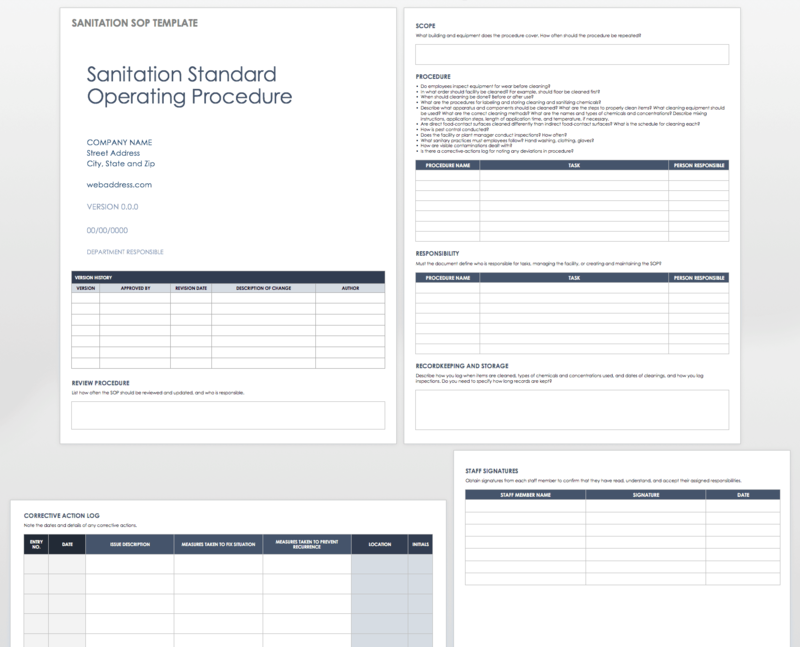 Called a Sanitation Standard Operating Procedure (SSOP), this Word document details cleaning procedures for food-related farm operations, such as packing houses. In this template, you describe what to clean, how to clean it, and who should clean it. 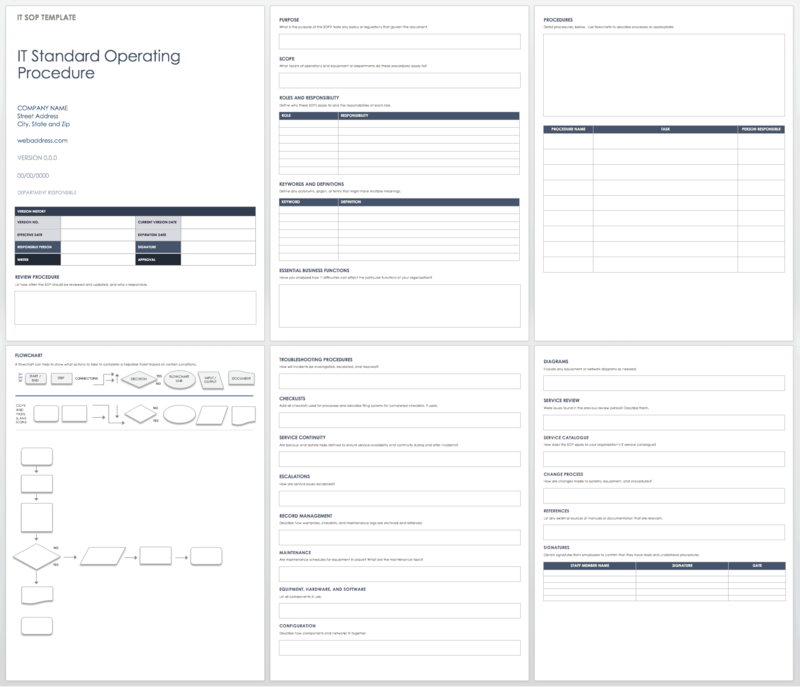 Standard operating procedure templates provide an easy way to document your processes. However, consider finding a tool that allows you to build powerful, repeatable business processes and workflows to ensure consistency and maximize success. One such tool is Smartsheet, an enterprise work management platform that fundamentally changes the way teams, leaders, and businesses get work done. Over 74,000 brands and millions of information workers trust Smartsheet as the best way to plan, capture, manage, automate, and report on work. You can build automated, repeatable business processes without a single line of code, complex formulas, or help from IT. Achieve faster progress by creating automated approval requests and automated update requests that are triggered based on preset rules. Use Smartsheet to automate and streamline the following processes: time card tracking, sales discounts, procurement, HR hiring, content, and more. Plus, Smartsheet integrates with the tools you already use, to seamlessly connect your efforts across applications. Get from idea to impact, fast, by building powerful, consistent business processes in Smartsheet.